Most know Stephen Hawking as the English astrophysicist, or just a sheer genius. Besides those who study algorithms and atoms for a living, what do the rest of us really know about Dr. Hawking? Turns out, there is much of his story to tell. 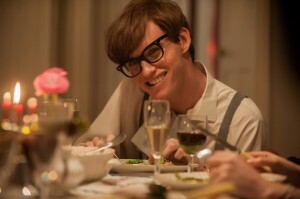 In director James Marsh’s (Man on a Wire, 2008) esteemed biopic, The Theory of Everything, audiences are exposed to Stephen Hawking’s (Eddie Redmayne, Les Miserables, 2012) simultaneous intellectual ascent and physical decline as he battles motor neuron disease, otherwise known as ALS or Lou Gehrig’s disease. More importantly, this drama showcases the bliss and challenges of his marriage with Jane Hawkings (Felicity Jones, The Amazing Spider Man 2, 2014), based on her memoir, Travelling to Infinity: My Life with Stephen. While a film about the ins and outs of a couple’s marriage may seem dull and ordinary, it’s precisely what makes this film extraordinary. It’s the early 1960s, and we first see an energetic, 21-year-old Hawking swiftly peddling his bike through the cobblestone streets of the University of Cambridge in England. Hawking and his friend head to attend a University function where he meets Jane Wilde, a scholarly foreign language undergrad. Next thing we know, Jane is visiting with Stephen’s parents over a delicious homemade meal and bad homemade wine. Stephen then invites Jane to the breathtaking May Ball, and the rest is history. Not long into their relationship, Stephen suffers a fall and is taken to the hospital where they diagnose him with motor neuron disease, a neurological disorder where the muscles progressively deteriorate – walking, swallowing and speech eventually become impaired. While Hawking is justifiably in shock about his diagnosis, he’s somewhat thankful to hear his brain would still function, until he is told he has two years to live that is. Despite Stephen’s short life expectancy and negative prognosis from doctors, Jane loves Stephen too much to believe it and simply looks at the situation from a different perspective. Jane and Stephen don’t waste any time. They quickly get married and start a family. Jane is Stephen’s rock to say the least. Day after day, Jane fights tirelessly by his side while Stephen studies his most ambitious theory – time, all while he’s simultaneously trying to fight it. The acting by both frontrunners, Redmayne and Jones is incredible. Redmayne is captivating in his role as he progressively loses almost all motor function. He is sure to receive an Oscar nod. Jones is compassionate and patient in her complicated role – married to a terminally ill genius, which is essentially burdening her career and responsibility as a wife and mother. Jane Hawking creates hope that audiences’ may have someone love them just as unconditionally as she loved Stephen. Charlie Cox (Hello Carter, 2013) is refreshing as Jonathan Hellyer Jones, the thoughtful choir director who ends up helping Jane look after Stephen and their three children as he essentially becomes an extension of the family. The Medieval architecture, the timelessness of Cambridge and its spectacular scenery, are notable in this film. The early scenes of Stephen and Jane at the May Ball under the stars are simply stunning. Marsh effectively utilizes symbols in several scenes to reinforce a point or moment in time. His camera angles and close up shots are also invaluable. The biopic captures a little more than half of Stephen’s life based on what we know from Jane and Stephen. This incredibly touching story makes reading the press notes all the more interesting. It’s fascinating to learn about everything that went into Stephen’s creation. In preparation for his role, Redmayne met with many ALS patients and Hawking himself, worked with a choreographer and began a strict diet to loose weight. Jones made a point to meet with Jane Hawking early on as well as countless other meetings. According to the press notes, Redmayne focused on even the smallest details when studying Stephen. Since Stephen couldn’t move his body, he used facial expressions to communicate. Redmayne said, “Jane discusses in her book how Stephen had incredibly expressive eyebrows. That was something I spent months working in front of a mirror on.” To remain consistent with the progression of the disease over the 48-day shoot, Redmayne created a climbing-numbers chart that would gauge how advanced the disease was in a particular scene. This method was incredibly helpful as like most films, The Theory of Everything was not shot in sequence. Jane still lives in the first home she shared with Stephen decades ago. She gave production designer John Paul Kelly and his team access to the house so they could recreate the sound stage to as close to the original as possible. Kelly’s team researched down to every last detail including the wheelchairs. Stephen had a progression of wheelchairs as he grew older and technology became more advanced. He went from a regular wheelchair to an electronic wheelchair followed by one that included a computer and voice machine. Beyond dressing someone in clothes too big for them to enhance an emaciated look, it was interesting to learn how the hair and makeup team used prosthetics on Redmayne. The team changed the shape of his ears and made them larger, along with his nose. In turn, this made his face look smaller. The painstaking time and attention to detail is a hallmark of a winning biopic when recreating a historical figure—and it certainly shows here. Bottom-Line? Eddie Redmayne’s captivating performance as crippled Stephen Hawking is Oscar worthy. The Theory of Everything goes beyond the ordinary biopic and becomes a moving love story that tugs at the heartstrings. Audiences will feel a range of emotions as they can empathize with both sides of the relationship, making it that much more impactful. What’s eventually left of Redmayne’s motor skills is what makes a lasting imprint in viewers’ minds. Despite his challenges, the contagious smile and the glimmer in his eye remind us that anything is possible, even when all odds are against you.